High-quality eyepiece for binotelescopes ! 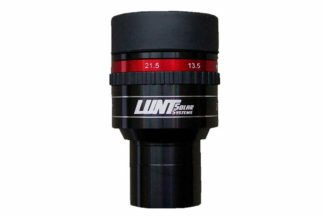 The 1.25 ” Ultra Flat Field 24mm Eyepiece features a high quality standard and a very compact design. Furthermore, it’s designed to remove the field curvature at the edge. Notably, this results in a flat, distortion-free image up to the edge of the visible field of view, even in very fast telescopes. The eyepiece has over sized eyepiece lenses for the largest possible field of view . Importantly, a 29mm eyerelief (also suitable for spectacle wearers) eye-rubber allow a comfortable view. All lenses (8 lenses in 5 groups) have a braod-band-multicoating (FMC) and blackened lens edges. The plug-in sleeve is equipped with a thread for 1.25 “filters.